Unlike the poetry of the First World War which caught the horrendous futility of man’s inhumanity to man, popular wartime music was used for propaganda. Many music hall favourites became a call to arms to defend the Commonwealth, with lyrics which appealed to citizen’s sense of duty promoting fervor, pride, and patriotism. They were deliberately used by authority to attract manpower, homeland support, and funds for War. When young men refused to enlist at theatres they were humiliated by being handed white chicken feathers by children assigned to this task. 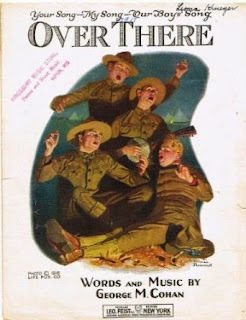 The most well known First World War song was, It’s a long way to Tipperary but when the US joined the Allies in World War I, George M Cohen’s Over There became the most successful pro-war propaganda song of all time. In the days before radio, home entertainment consisted of a piano and sheet music sold was like records. The cover of the sheet music for Over There was drawn by Norman Rockwell ensuring more than 2 million copies sold with the proceeds going to War Bonds in the US. No less a personage than Enrico Caruso recorded versions in both French and English versions, ensuring an international success. The best known war song started life as a poem, “Das Lied eines jungen Soldaten auf der Wacht" ("The Song of a Young Soldier on Watch") and was written by a German conscript in 1915. 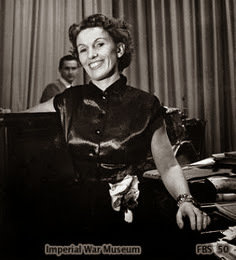 Between the wars it was set to music and recorded by Lale Anderson in 1939. After the Germans captured Belgrade in 1941, Radio Belgrade became the German forces radio station and broadcast throughout Europe and the Mediterranean. Because of their lack of available records the station played Lile Marlene every night at the same time. The song became so popular with German and Allied troops alike they stop fighting when the song was played. 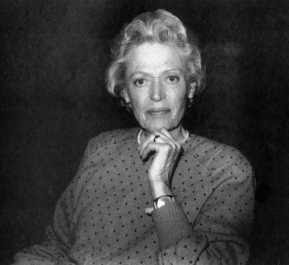 A second version was recorded in 1942 which is now the version most associated with Marlene Deitrich. By the Second World War the influence of movies and radio on the general public saw the rise in celebrity and the power of the personality. Next to the pin up girl who graced every soldier’s kit, the forces sweetheart was ubiquitous. The first forces sweetheart was Lady Angela Forbes, a First World War catering organizer who took particular interest in the welfare of the troops and spoke out publicly about her concerns in regard to the conditions at Etaples Camp in France. By the Second World War, singer Vera Lynn was the forces sweetheart, and sang most of the popular war songs but her greatest were White Cliffs of Dover and We'll Meet Again. Both helped to boost morale during the darkest days of the war. 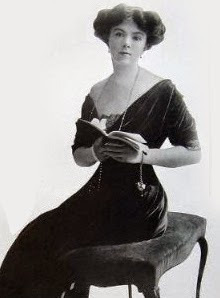 In Australia Mary Ward Breheny (West Australian) was the first female radio announcer for the Australian Broadcasting Corporation and as the "forces sweetheart" became Australia's reply to Japanese wartime propagandist, Tokyo Rose. .
As had happened in the First World War, as soon as the US mobilised for war, American culture became every present in Europe and Australasia. With thousands of troops now stationed overseas it was inevitable popular music would become all American. The American Sound was brash and romantic with soaring riffs from saxophones in concert with the clarinet, whereas British popular music was more consciously nostalgic. The Andrews Sisters were ever present as the new swing was played by orchestras like Glen Miller ensuring dancehalls were filled with young revelers, many of which were to enjoy a very short life. Defiance in the face of tyranny was a common theme and many popular war time songs were parodied with humorous, satirical or even vulgar verses added. The best known was "Colonel Bogey March" which was written in 1914 by a British military bandmaster. The tune was inspired by golf and composer used the whistle instead of shouting “Fore!” Bogey is a golfing term meaning one over par but "Colonel Bogey" became the authorized march of the King’s Own Calgary Regiment of the Canadian Forces. Another popular song to receive the same treatment was Irvin Berlin’s, Bless them all. Humour was never far away and these songs were aimed at keeping moral high on the home front, as well as to give the fighting man some perspective into the ludicrousness and futility of war. Flanagan and Allen’s Run rabbit run was a particular wartime favourite and the song was inspired by the first victims of German aerial bombing on Allied territory. Classical music also enjoyed a vogue during the war years. When the Warsaw Concerto was used as the theme music in a British movie, Dangerous Moonlight (1941). The Rachmaninov sounding theme became an instant success all over the world.